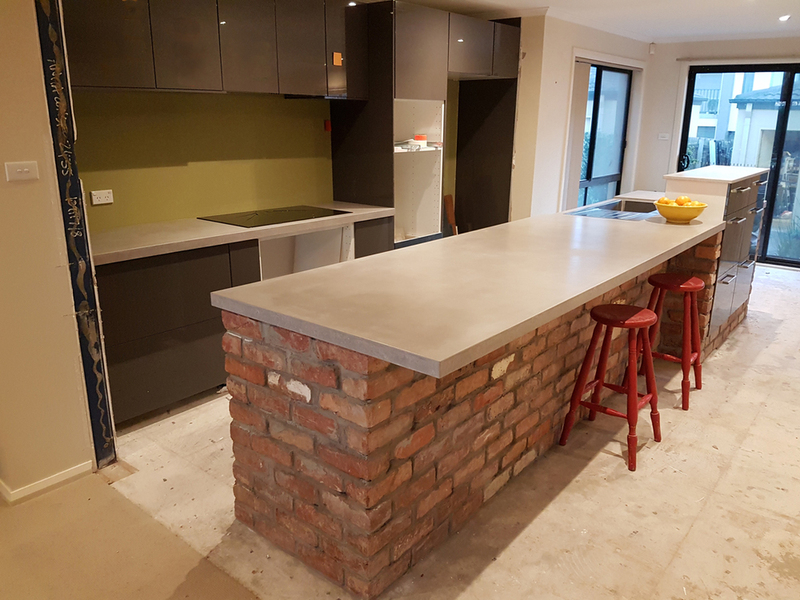 We use a proven sealer made for concrete benchtops, called ICT. We import it from the United States, where concrete benchtops have been in homes for 20 odd years now. The sealer is very clear, like a window into your benchtop. Its renowned for its scratch resistance and stain resistance. It has a unique application method, check it out here. We will try to match any colour you desire through the use of pigments, and concrete stains for brighter colours. 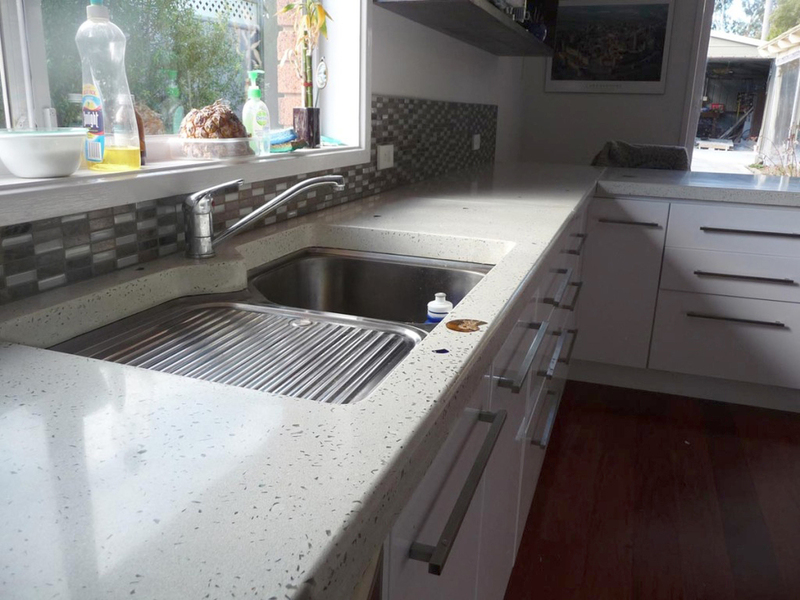 Your benchtops will also be influenced by the amount of sand and aggregate exposed with grinding. Most people today prefer no grinding. Leaving the cream layer for a natural concrete look. We encourage people to embed small wall tiles, fossils, gems, brass strips etc. They often become the favorite part of the benchtop. creating voids with a very dry mix and later back filling the voids with different colours. Our High Performance Concrete is a little lighter than normal concrete, but we also use alot of hidden cavities to reduce the weight of thicker benches. Most standard cabinets will support our benches. Our standard price is $1100 per square meter, installed. Most kitchens, up to 50mm thickness, are charged at this rate. Difficult installations, such as crane hire, are an obvious expense. Measure your benchtops and calculate how many square meters you have. Calculate your quote with the above rate. Or email me a rough plan of your kitchen and I will get straight back to you. But don't hesitate to just ring me to ask about your benchtops options. We arrange for a site inspection to talk over your project, inspect the requirements and the access. We agree to proceed and you pay a 30% deposit. We put you onto the production schedule and a installation date is made. We happily fabricate your benchtops, which take approximately 3 weeks. Installation day of your benchtops that I know you will love. Our installation trolley will be rolled along side the cabinetry, the trolley will tilt and flatten our. We push the bench into its final resting place. All our kitchen bench tops come with a one year structural warranty and your choice of some great pots and planters unique to Digitizedstone.